The new TexStyle ranges in 3 different colours, the SI7066VI (Violet), SI7042BK (Black) and SI7088GY (Grey). 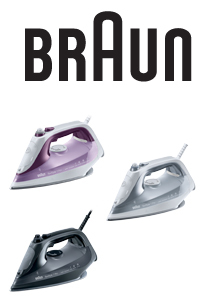 All of these irons feature Anti-Calc, 300ml Tanks and 2.5m Cord length. The SI7066VI features 2600W and a 225g Steam Shot. The SI7042BK features 2400W and a 220g Steam Shot. Finally the SI7088GY features 2800W and a 230g Steam Shot.